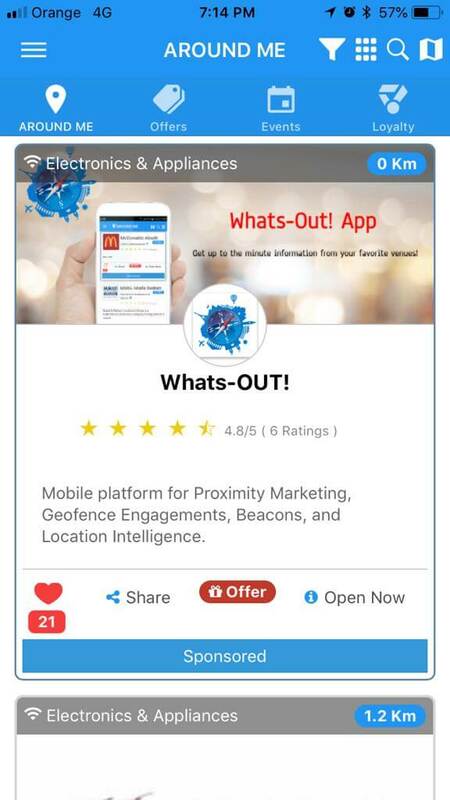 Whats-OUT is an effective location-based mobile marketing app that combines a powerful proximity marketing platform, loyalty programs application & geo-locations based Business Listings that delivers your digital marketing messages, campaigns, events & promotions directly to your customers. WHATS-OUT lets you analyse your digital marketing, your customer's activity, patterns, behavior, while validating rewards & coupons through a multi level administrator app and rich CMS dashboard. deployment and visualization into one system. The key to being successful on mobile is about relevant. People take their mobile devices everywhere - work, holidays, sports classes, night outs - you need to be part of their life, not an intrusion. With our platform, you can understand your user's behaviors in the real world and make sure to reach out when it's most useful to them. Know and engage your mobile users in the real world. Whats-OUT is a complete marketing toolset that enables to reach your customers at the point of decision with beacons, geofences, QR code contextual campaigns to strengthen relationship and provide the information they seek at the right time and place. Setup and manage your events on the Whats-OUT app. Let users around you find your event venue, with full details, start and end dates, admission prices, registration URL and directions to the venue. Create and manage your offers. Activate them when you wish, and link them to your venue listings. Add scarcity - Time, or Quantity based offers, Single or Multiple redeems and much more. 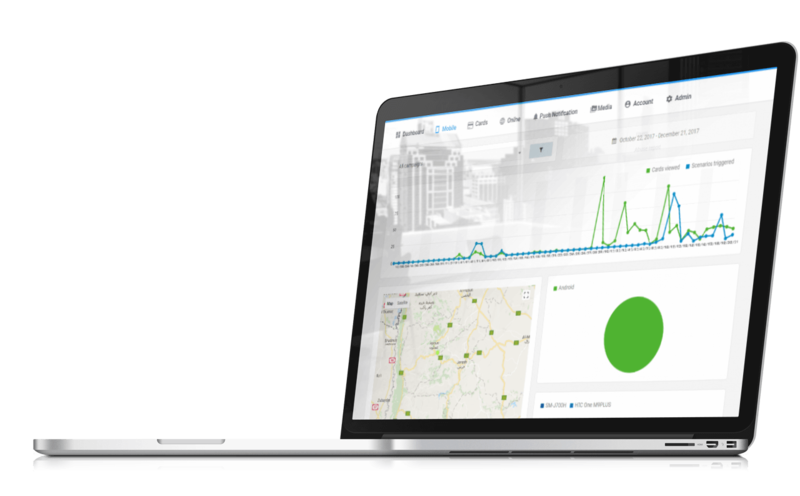 Setup and manage geofence infrastructure across your locations. Simply create a geofence around the region you need to trigger proximity promotion to. Ideal for interactions in a larger area than the beacons and great for driving more foot traffic to your store. No installation or hardware is required to use this technology. Setup and manage beacons infrastructure across your locations. Simply add a Beacon and its location. We are compatible with all manufacturers of iBeacon and / or Eddystone and with all security protocols. Create and manage multiple types of Loyalty Programs, including Punch/Stamp Cards, VIP Cards, Points Systems, Multi-Tiered Memberships, Check-ins, and Pre-Paid Stamp/Punch Cards. Activate them when you wish, and link them to your venue listings. Define which notifications and content is pushed when customers visit or are in proximity of your geofences and beacons. Your content can be in multiple languages so people will see it in their phone native language. Send push notifications to your user base. Inform them of new offers, business news, updates and more. Schedule your notifications or send them immediately. View your reports and get the full picture. Advertise your Whats-OUT app presence, and encourage visitors and customers to download and enter your special code or QR. Set-up continuous campaigns which run in the background. A birthday club sending out a notification x days before a customer's birthday. Bring back lapsed customers by sending them special and irresistible offers requesting a review from your active customers, with a direct link to your preferred review page such as Facebook or Yelp etc. Our tools allow you to check how your competition is doing. Get insight into their daily visitors, user interactions, loyalty scans and more. Simply set the diameter around your business and pick the competitors to monitor. Measure your Return on Investments when you run special offers, deals or coupon campaigns. Find out what other products or services were also purchased as a result, and total transactional values. Be relevant and present for your customers with the right content at the correct moment. Make it memorable! By using our personalization option, make your notifications personal and address them by their names! Laser target your message to the correct audience using our many filters on Age, Gender, Devio and more. Our platform provides you with real-time insights and analytics for all your locations and customer interactions. Whats-OUT uses a simple single app for all brands and users! People download the app , check places, events, deals, and loyalty offers around them. They engage with your listing by adding you to their favorite list or by scanning your QR code for an offer, Loyalty program, or other marketing campaign QR code. Thats it! Your campaigns and notifications will now be triggered based on the pre-defined scenarios. Users will use it when they have the intent to buy a product or service. Users will keep it because it gives them access to all their favorite places. Users will love it because it engages them, and allows them to earn rewards and gifts. Users know your business - this is the power of Local Businesses. Whats-OUT Re-Targets & Engages your audience when they are around you, with your notification, irresistible offers and deals or simply a quick message to tell them about what's new, using their loyalty card and much more. Use location to engage with your users at the right time, and place! Harvest the opportunity and partner with us. We offer a great opportunity for you selling state of the art proximity marketing solutions. Show deals and discounts when users walk around stands. Open a video when a user holds his/her phone near a product in your store. Show different contextual content for object based on day, date and/or time. Open a loyalty card when a user is near the checkout. Copyrights &COPY; 2017-2019 All Rights Reserved by Whats-out.com.